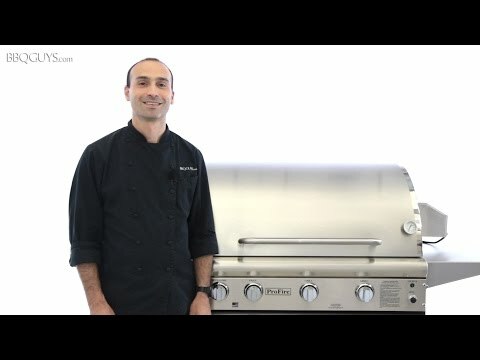 This ProFire Professional Deluxe Series propane gas grill features three controlled grilling zones with six 11,000 BTU stainless steel burners that push 66,000 BTUs of total cooking power on the grilling surface, and an attached 30,000 BTU double side burner. The 16 gauge, commercial grade stainless steel flavor plates are self-cleaning and distribute heat evenly over the entire 714 square inch cooking surface while minimizing flare-ups. The grill is constructed of commercial grade stainless steel with a sleek, curved double lined hood and polished mirror finish. This grill includes rust-free, anodized aluminum SearMagic cooking grids that heat quickly and cook foods at a uniform temperature. These unique cooking grids is reversible. Use the wide, ribbed side for larger cuts of meat for restaurant-style sear lines. Or, flip it over and cook on the smooth side when grilling more delicate items such as fish or vegetables. This ProFire Professional Deluxe Series grill also comes standard with a stainless steel warming rack, a stainless steel smoker tray, dual purpose thermometer, and electronic multiple spark ignitor to enhance your grilling experience. Stainless Steel cart includes two stainless steel fold-down side shelves, access doors for storage, and a LP tank slide out tray. 33 3/8 X 20 1/2" 32 1/4 X 20 1/4" 30 X 22" 30 X 18"